The year is 1907. In the United Kingdom, the open-road speed limit is 20 mph (around 30 km/h). There is only one automotive racing track in the whole of the country – a huge bowl with steeply banked corners, built near Weybridge, Surrey, by an eccentric and wealthy car enthusiast. Cars appear dwarfed by this enormous track, and they can be driven flat out for lap after lap – the banking is so steep that no throttle lift is needed for the corners. The track? 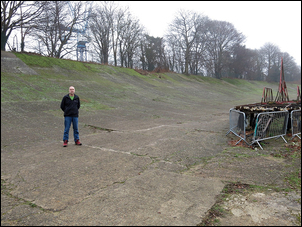 Brooklands – now visible only through the remnants of moss-covered banking that still exist. But the cars at Brooklands didn’t stay slow and boring for long. Wealthy enthusiasts – almost all racing car drivers were then wealthy enthusiasts – like fur trader John Cobb raced at Brooklands. Initially, he used machines that were bought from others, but in 1932 he commissioned a car to be built just for him – and for tracks like Brooklands. 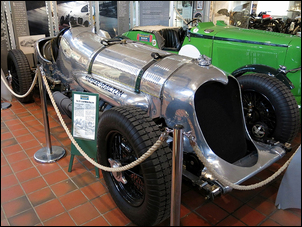 This car – the 24 litre Napier Railton – is one of the most incredible racing cars ever seen. Built by Thomson and Taylor Ltd, a company located within the Brooklands track, and designed by Reid Railton, the car was then state of the art. A massive art, it must be said. For this was the era when bigger and stronger and heavier was seen as the way forward for speedy machinery. The engine was a 502hp (some references say 535hp) Napier Lion, a famous WWI aircraft engine. This used 12 cylinders arranged in three banks of four – a centre upright bank and the two others at an angle of 60 degrees. Capacity was just under 24 litres, and the engine developed its maximum power at 2200 rpm. Single overhead cams were used – one per cylinder bank. This version of the engine was naturally aspirated. The crankshaft had four throws, with three connecting rods positioned on each crank pin. The engine may have been available off the shelf – but what to put it in? A custom car was built around the engine. The chassis was constructed with deep channel-shaped side members, connected by round cross-tubes as well as channel-section members. 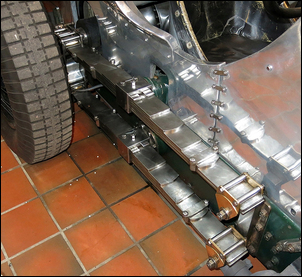 Unusually for the time, the chassis members passed beneath the axles, allowing the car to be built low. 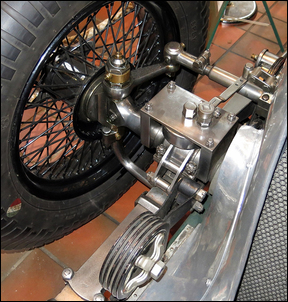 At the front, half-elliptic springs were used, while the rear axle was located by dual cantilever leaf springs. Friction dampers were used, with remote control allowing the driver to adjust damping while on the fly. The chassis and suspension of the car were massive, appropriate for a non-monocoque car with a weight of about 1500kg. The engine drove through a relatively petite 3-speed Moss gearbox. In the indirect ratios, the gearbox was under-rated for the torque – the idea was to gingerly let the car come up to high speed before then nailing-it and holding it in top gear. An open Borg and Beck clutch was fitted, and drive from the gearbox went via a Hardy Spicer propeller shaft to an ENV final drive with a 1.66:1(!) ratio. The differential had its own light-alloy oil sump. 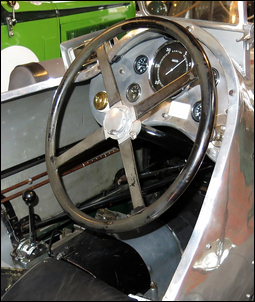 Giving some idea as to the car’s purpose – to go, not stop – brakes were fitted to only the rear axle. In the manner of the day, Cobb sat close to the rear axle line. The engine, positioned just behind the front axle, took up about a third of the length of the chassis. The body had little front and rear overhang. The body, built by Gurney Nutting Ltd, was of light alloy sheet. As with all fast cars of the time (except Land Speed Record contenders), no attention was given to aerodynamics. Tyres were a weak point. They were Dunlops, initially 35 x 6 in size. They were mounted on Rudge wire wheels with central knock-off hubs. Because session duration would be limited by tyre life, the fuel tank was regarded as being relatively small – despite having a capacity of 295 litres! There was also a reservoir for oil; this was 68 litres in volume. For long distance racing, the car was equipped with an additional hand throttle, Rotax lighting and screened sparkplug leads (allowing the possible fitting of a [very big?] radio for communication with the pits). 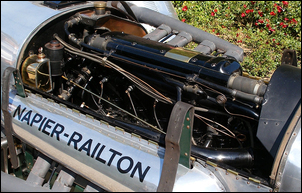 Between 1933 and the advent of WWII, the Napier-Railton set numerous records. At Brooklands in 1935 it set the fastest-ever outer circuit record – an average of 143.44 mph. In 1937 at Brooklands it won a 500 mile race at an average speed of 121.28 mph – the fastest average for a 500 mile race until 1949. But ironically it was away from Brooklands where the car most starred. Taken to Bonneville salt flats in the US, the car set the world 24 hour records in both 1935 and 1936 – averages of 137.4 mph and 150.6 mph respectively. In its competitive life, it broke 41 world and international records. John Cobb died in 1947 attempting to break the Water Speed Record (he’d already been successful at the Land Speed Record in another vehicle using two supercharged Napier Lion engines) and the 24 litre Napier Railton fell into disrepair. It was used as a prop in a film, and then – oddly enough – in the mid-1950s, to test braking parachutes normally fitted to aircraft. In around 1997 the car was purchased by the Brooklands Museum where it can be seen today, fully restored and in working order.